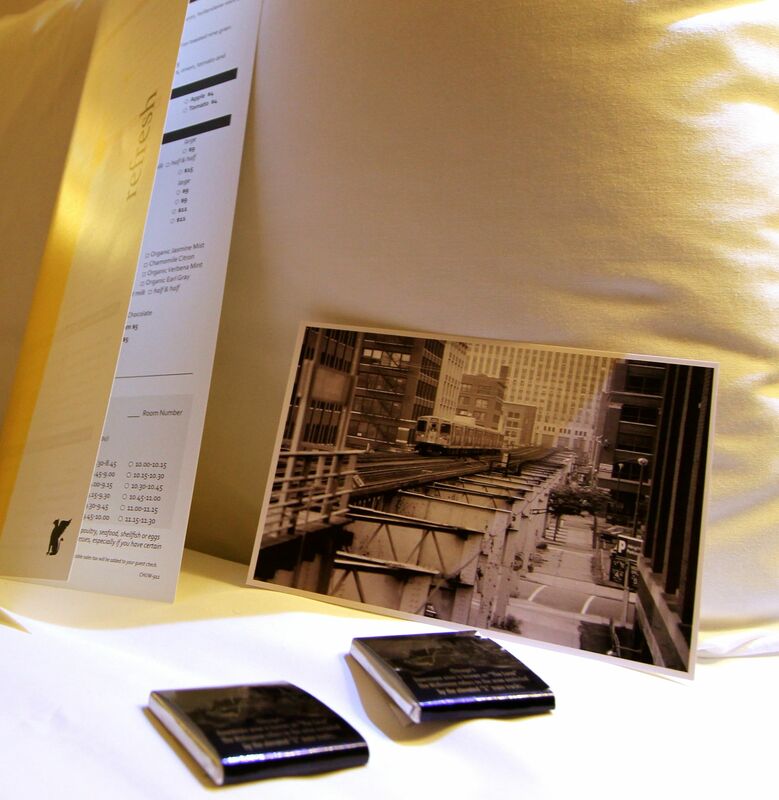 Mints on the pillows at The JW Marriott Chicago. SHHHHHHH! Don’t be afraid, I’m a friend. Listen to me: They’re coming, they’re hungry, but we won’t be here when they crash the place. Don’t worry, you’re not trapped, we’re gonna get you outta here, pal. What do I know? I know more than you think. I know that a crowd of entitled and belligerent family members are getting ready to descend on your house, barking drink orders, dominating the television remote, eating all the sweet potato soufflé and spouting their wacko political views between forkfuls of turkey and mashed potatoes. And all the while, you’re a prisoner of your own courtesy, biting your tongue, washing the dishes and dreaming of escape. 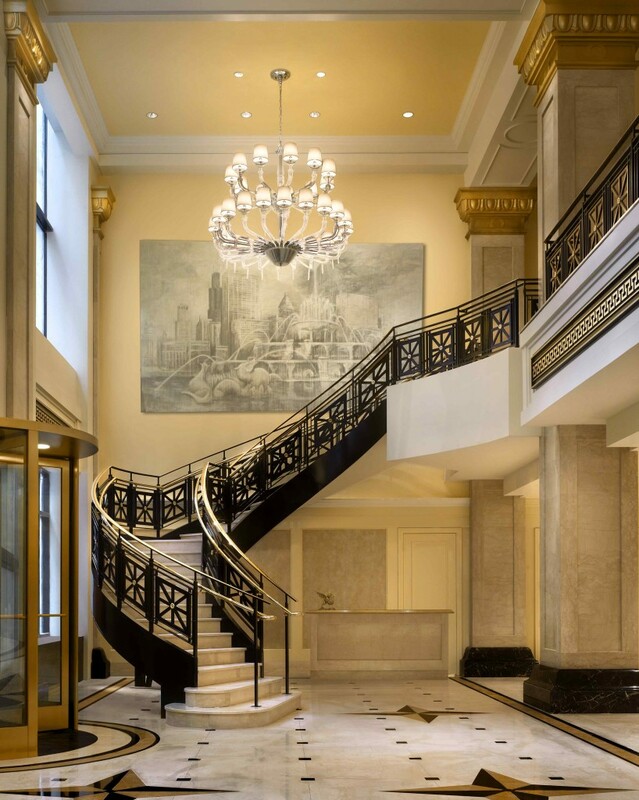 The lobby stairs facing Adams Street in the JW Marriott Chicago. Photo courtesy of JW Marriott Chicago. And that’s what I’m offering: Escape. Refuge. Solace. Pampering even. And having someone wait on you for a change. I’m here to lead the way. Take my hand if you want to live — live like a king, that is. We’ll head south across the border. They’ll never look for us in Chicago. And I’ve found the perfect safe house. Couple years ago, it was still the old Continental & Commercial National Bank building. Built a hundred years ago by some long-gone Prairie Avenue swell. Burnham somebody. That was in the old days, but lately some bright boys gussied it up and gave it a shine–to the tune of 400 million bucks–and now you step inside and feel like you’re in a palace. It’s a triumph of neoclassical commercial architecture. Least that’s what the Poindexters say about it. Name over the door is JW Marriott. The location is perfect, right in the heart of the Loop, and ideal for hiding in plain sight, as they say. Hey, when I patted your back just now I couldn’t help but feel that hard bulge under your coat. No offense, we’re gonna have to pat you down and check it out, can’t be too careful. 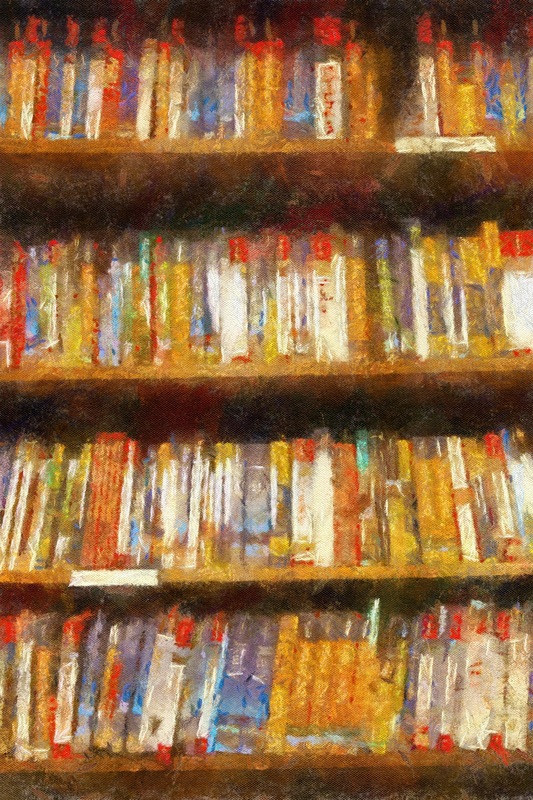 Whoa – my friend, you’ve got more knots than a sailor with obsessive-compulsive disorder. Did you know that stress is a number one killer? Well, they’ve got just the thing for that. The JW Marriott’s got friends in the underground (right under the lobby) that are trained specialists. Ask for Valeo. They’ll give you a new face—one with a big, loopy grin on it—and no one will recognize you back home. I know just the thing that’ll put ‘em off our scent. 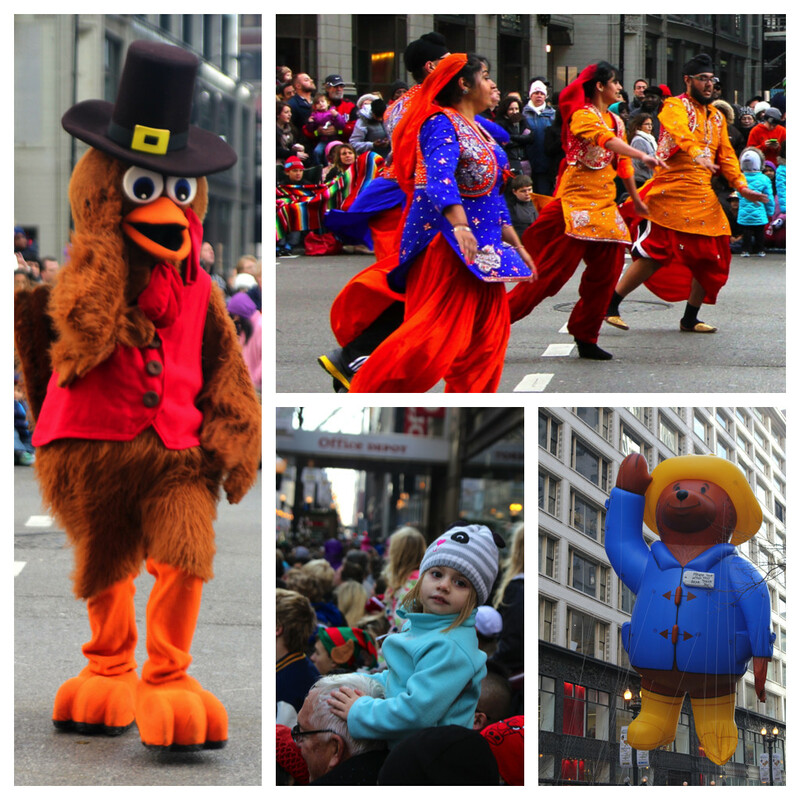 Let’s lose ourselves in the crowd of the Thanksgiving Parade. Little trick I learned from Doctor Richard Kimble one time. Our timing couldn’t be better; this year is the 80th anniversary of the parade. They used to call it the Holiday Caravan back in the day, now they name it after some Scottish clown. That’s okay, whatever, all you need to know is that it’s a hoot. 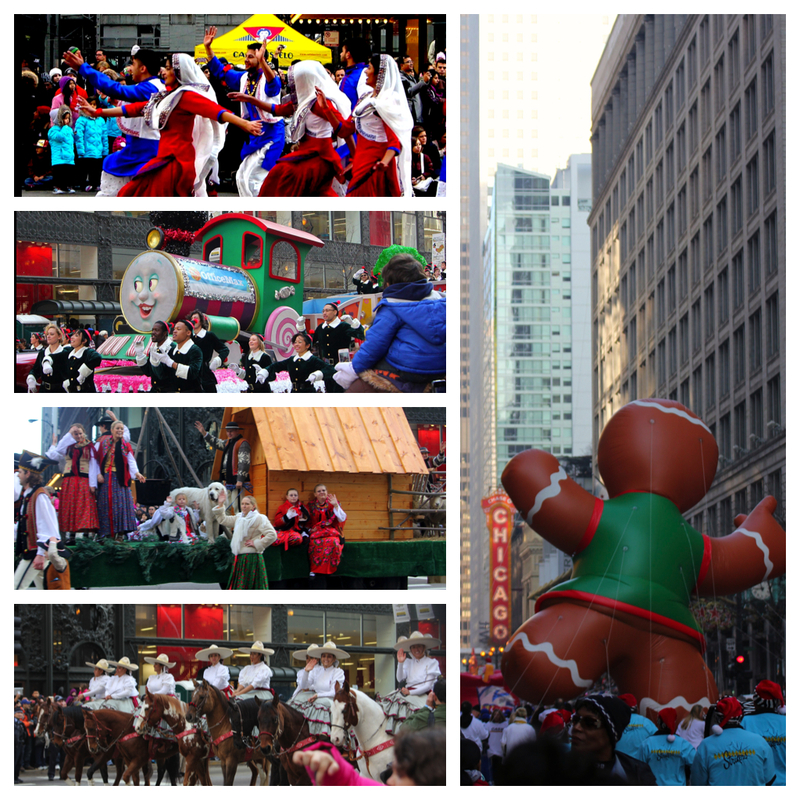 The JW Marriott is just two blocks from the parade route, which starts at Congress and goes all the way to Randolph Street. Man, what a scene, huh? Something like 400,000 people are hitting the Loop this morning. And they’re all smiling for the same reason you are: none of them had to turn their house into a soup kitchen today for freeloading relatives. Talk about feeling thankful, forget about it. I know, you wanna talk about diversity? It’s like the United Nations just broke for recess and everybody came out to play. It’s just one of the things I love about this town; it’s made up of a little – or a lot – of everybody from everywhere, and somehow they make it all work. Pay attention now. The big float with the sleigh. See that guy in the red suit? – geez, don’t be so obvious about it. They call him the Jolly Old Elf. Remember him, we’ll meet him later, but not here, too many people around. In the meantime, just relax and enjoy the parade, my friend. One block west of State and Washington is the Christkindlmarkt. Anyone coming around here looking for you would swear they were in a Bavarian village; that’s sure to confuse ‘em. We’ve got a little time before our rendezvous, so we can grab a bite and get a little holiday shopping in for now. 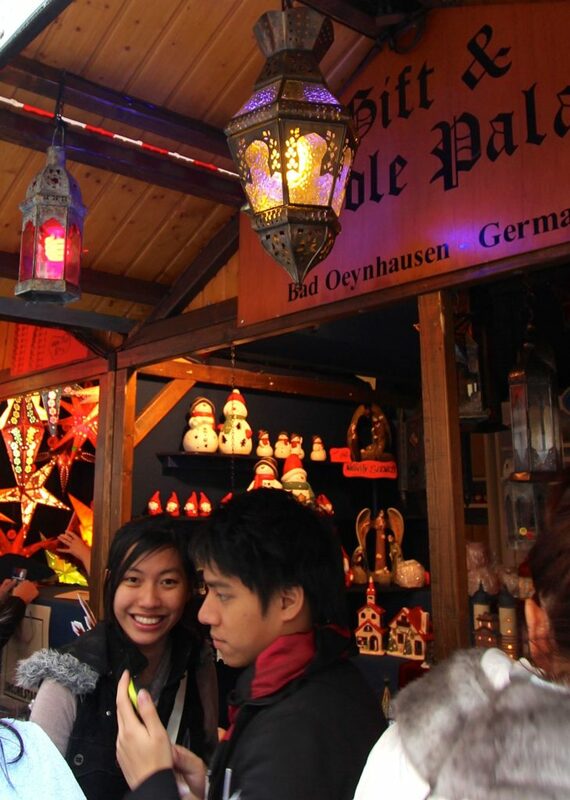 Shopping for holiday gifts at the Kristkindelmarkt. Hey, now’s your chance to talk to The Big Man. Keep it short, but tell him what you want. If he puts a finger aside of his nose, that’s your cue that your little audience is over and we can head back to base. Back in Milwaukee about now, they’re milling around your porch, ringing the doorbell, starting to get wise. But you’re safe here. When you’re ready, let’s go to the Florentine restaurant in the JW Marriott for a Thanksgiving dinner you’ll never forget. Nice place, huh? You bet it is. C’mon, pick your jaw off the floor and have a seat in the booth. Hey, kiddo, relax, no one knows you’re here, remember? Now it’s your turn. This is your reward, and after all those years of doing the work, you’ve earned it. No waiting on the other members of the family; let them get their own Thanksgiving dinner, right? Smart money says that George Webb is calling their names right about now. Here comes our contact. He’s gonna ask you what you want to eat and drink, but you need to listen to his advice; he knows what he’s doing; he’ll steer you right. Last time I was here I ordered a superb garganelli verde with black truffles, and — like a dummy — I was all set to order a viognier to compliment it. Bad move, I know that now. But this guy, he put me onto a dynamite Piemonte rosso that paired beautifully with the nuanced pungency of the truffles, and together they resonated with a true sense of terroir, greater than the sum of its parts, forming a culinary celebration of the exquisite, unctuous complexities of… What, do I have two heads all of sudden, whattaya starin’ at? So anyway, it’s good, is what I’m sayin’. 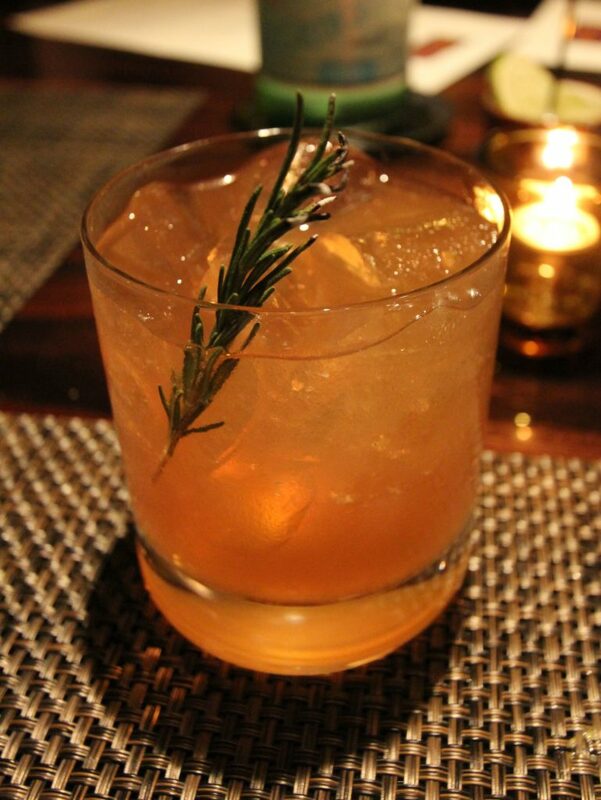 The “Thyme Will Tell” at The Florentine Restaurant at The JW Marriott Chicago. But here’s a tip, no matter what you wanna do, start things off with one of their craft cocktails. You can’t go wrong. The guy behind the bar knows his way around an infusion, if you know what I mean! Okay, so you don’t know what I mean, skip it; just have one, for crying out loud, okay? Cripes. Here, try the “Thyme Will Tell”; tequila, fresh-squeezed lime juice, thyme-infused syrup and a splash of prosecco. Yeeeah, see? Nice, huh? But that’s the tip of the iceberg, my friend. Chris Maccia is doing the cooking here and the man is no slouch. Try the carpaccio with upland cress and taleggio aioli, or the braised rabbit with farrotto and pancetta. And they got a porterhouse steak that could make a grown man weep. Weep. 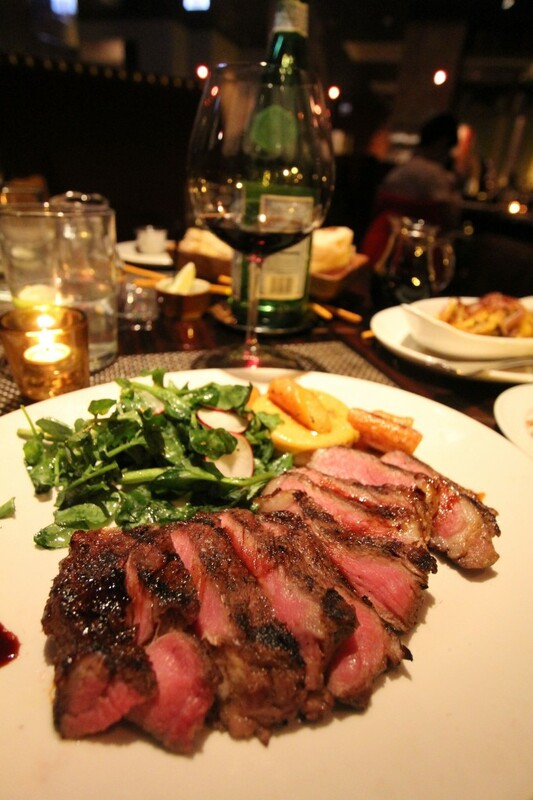 Porterhouse steak at The Florentine Restaurant in the JW Marriott Chicago. Save room for dessert, too. There’s vanilla bean panna cotta with prosecco-marinated stone fruits, peach purée and honey, or try the pistachio gelato with Michigan cherries and pistachio cream. Nice to let someone else do the cooking for a change, isn’t it? Man, after a feed like that, you know what’s good? NOT washing dishes, that’s right. And not wondering how long it’ll take for your crazy aunt to get snookered enough on slivovitz to have her annual meltdown. Bottoms up, my friend. You’re not driving home tonight; a first-class bed is waiting for you on the upper floor with chocolate mints on the pillows. Okay, this is your stop. See, mints on the pillows, just like I promised. Marble-lined bath is through there, mini-fridge packed with goodies over there, flatscreen on the wall, remote on the bedside table at the ready. Room service is a phone call away, and the breakfast they bring to your door is top-notch. Hey – what… geez, are you crying? Get ahold of yourself, pal, I told you I’d get you outta there, and I made good, that’s all. No, no, don’t hug me, don’t – aaahh…okay, okay. Yeah. I love you, too, sure. Look, stay here tonight until the heat is off, and head home tomorrow rested and refreshed. Yeah, that’s the stuff. Thanksgiving is right. You’re welcome. • 3:00 p.m. check-out Use promo code LVU when ordering. For more details, click here.